Burma Street (Mandarin: 緬甸街) goes by many names. 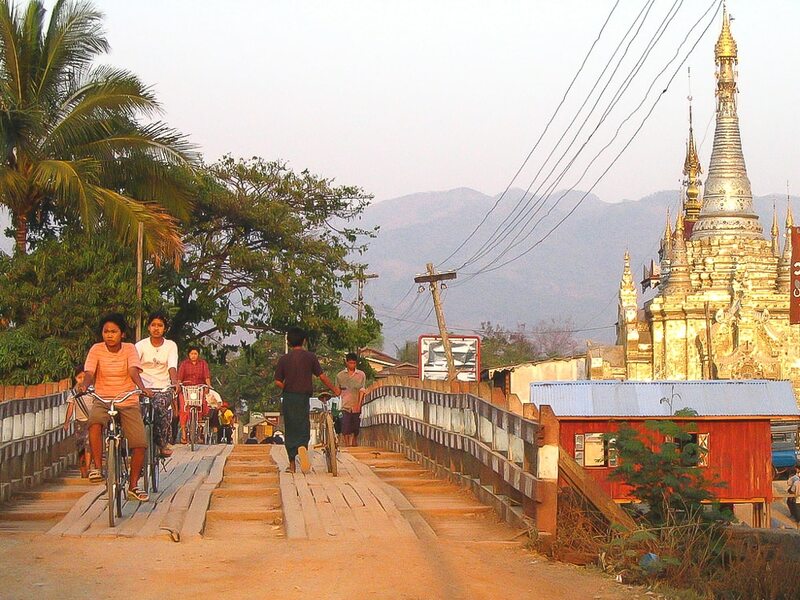 Myanmar Street is derived from the country’s official name today, while many still prefer the Southeast Asian nation’s former name, Burma. 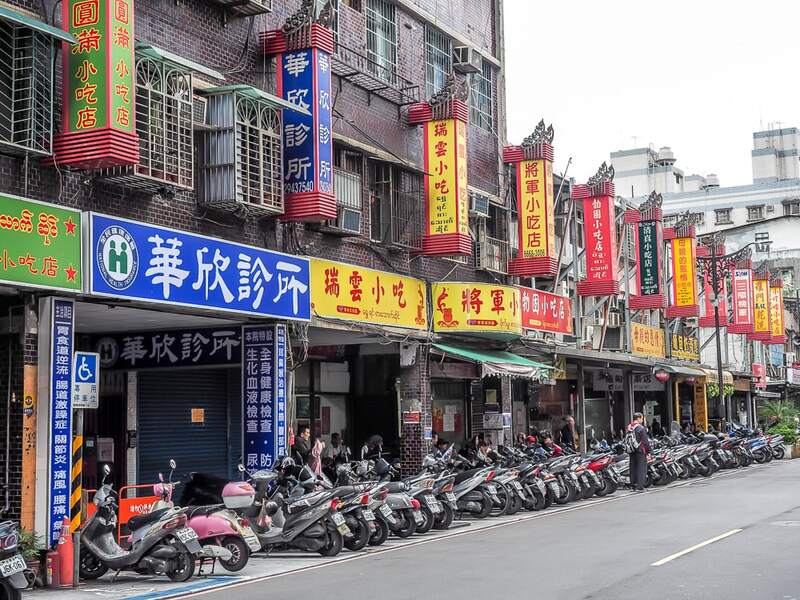 The actual street in Zhonghe, a crowded district of New Taipei City, is called Huaxin Street (華新街), while the New Taipei City government officially goes with Nanyang Sightseeing Food Street (南洋觀光美食街). Whatever you want to call it, food lovers need to visit this street ASAP for its incredible array of Burmese-Chinese food, a rare and special treat in this corner of Asia, thanks to the approximately 40,000 Burmese people who reside there, one of the largest immigrant communities in Taiwan and of Burmese-Chinese people outside of Burma itself. 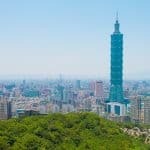 Visiting the street is one of the the great ideas for off-the-beaten-track things to do in Taiwan, and it makes my list of 50 top things to do in Taipei. When I used to teach at Hwa Hsia University of Technology, which lies at the southern end of Burma Street, I ate lunch on Burma Street every day and it was always the highlight of my day. I tended to frequent the same few places every time because they were so damn good, but I’ve recently returned multiple times to come up with a thorough food tour of this culinary anomaly on the outskirts of Taipei. Eating there truly takes me back to the time, more than 10 years ago, when I visited Myanmar to take in Inle Lake and the incredible temples of Bagan. Note: if you’re visiting Burma Street you should consider checking out the giant Tudigong (Earth God) Statue at Hongludi Nanshan Fude Temple in the same neighborhood (article coming soon!) Also read about the Museum of World Religions in Yonghe, New Taipei City, which was founded by Buddhist monk who was among the many Chinese-Burmese who settled in Taiwan. 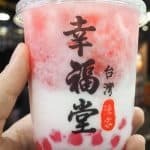 For a completely different food tour in Taipei, check out my article on the best street eats, restaurants, and drinks in Ximending, Taipei’s funkiest neighborhood! How is it that some so many Burmese people came to call Zhonghe, New Taipei City home? In fact, based on the commonly cited figure of 40,000 (my guess is that this number must be higher today), the Burmese-Chinese community makes up nearly 10% of Zhonghe’s total population. Obviously that never happened, and in 1954, approximately 7000 soldiers and their dependents, as well as many Burmese-Chinese people, were repatriated to Taiwan and settled in the Zhonghe area, with thousands more coming in the following decades. With them they brought Chinese-Burmese customs, religious beliefs, and of course, foods. If you’ve never had Burmese food, you’re in for a real treat. Due to the country’s location, its cuisine combines influences from Thai, Indian, and Chinese. 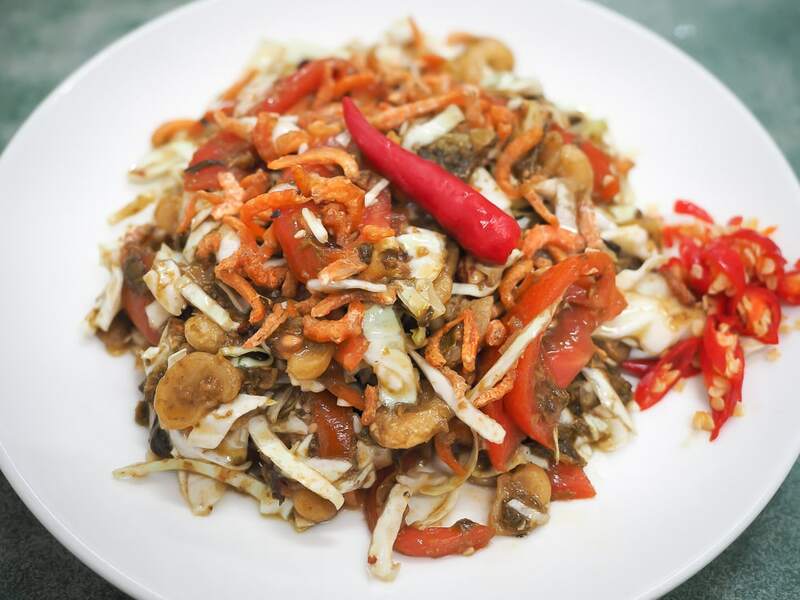 Common ingredients include seafood, rice, noodles, coconut, potato, ginger, lahphet (pickled tea leaves), ngapi (fish paste), chilis, ginger, tamarind, and meat. 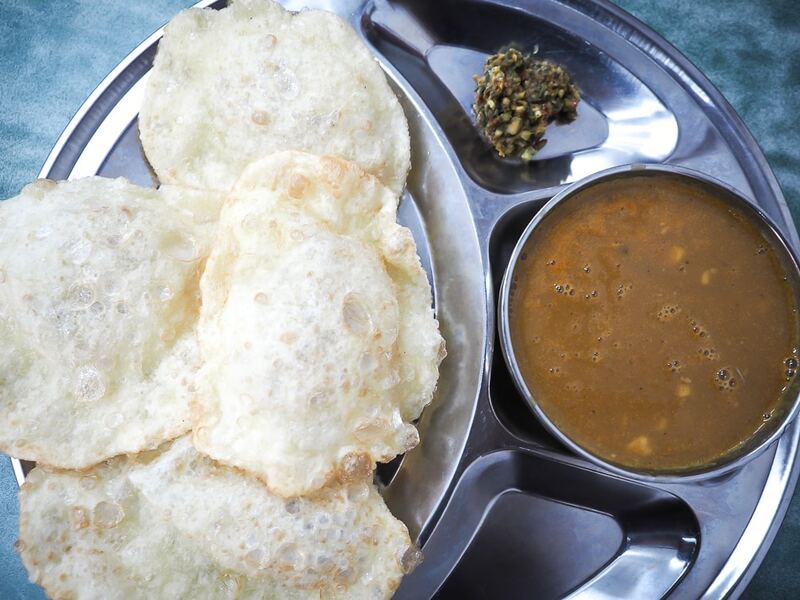 Typical Burmese dishes you can find on Burma Street include mohinga (a breakfast dish of noodles in catfish curry with banana tree stems that is served as early as 5:30 a.m., but is now sold throughout the day), cold tossed noodles, lahpet thoke (fermented tea leaf salad), Indian flatbreads such as rotis and parathas, and Southeast Asian-style milk tea. As can be expected in a community with such mixed roots, many of the restaurants on Myanmar Street combine dishes and cooking styles from Burma, Yunnan/Southern China, Thailand, India, and Taiwan. 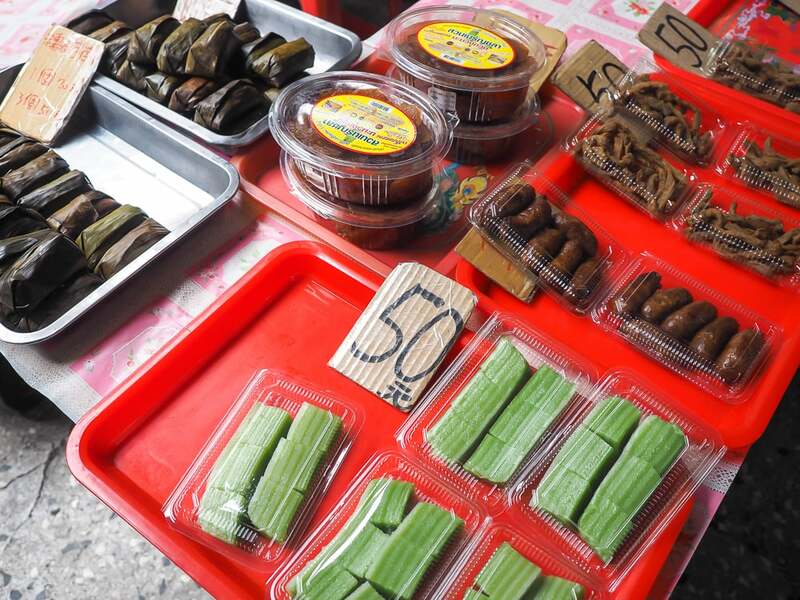 You can also find Indian/Burmese-style betel nut on Burma Street, totally different than the Taiwanese kind, as well as a variety of Southeast Asian food items in the street’s numerous grocery stores. The quintessential scene on Burma street is of groups of (mostly male) Chinese-Burmese seated at street-side tables enjoying milk tea, Burmese side dishes, and countless cigarettes over prolonged conversations. 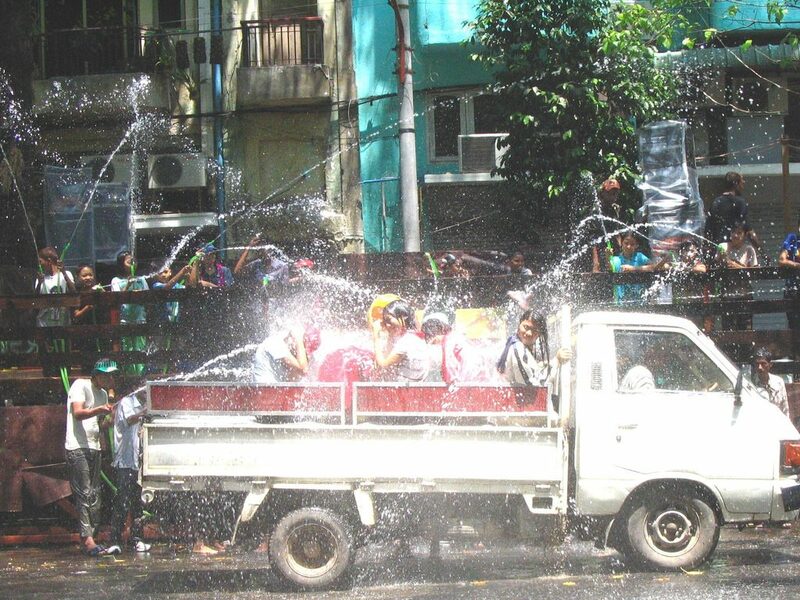 Burma street is also the location of the largest Songkran (Southeast Asian New Year) celebration in Taiwan, which takes the form of a huge water fight on the street around April 13-15. Note that lunch is probably the best time to visit Burma street, and more shops are open on weekends than weekdays. On Mondays, most of them are closed. From exit 4 of Nanshijiao MRT, the southern terminus of the orange line, turn right on the main street (Xingnan Rd). It’s about a five-minute walk to the entrance of Burma Street. 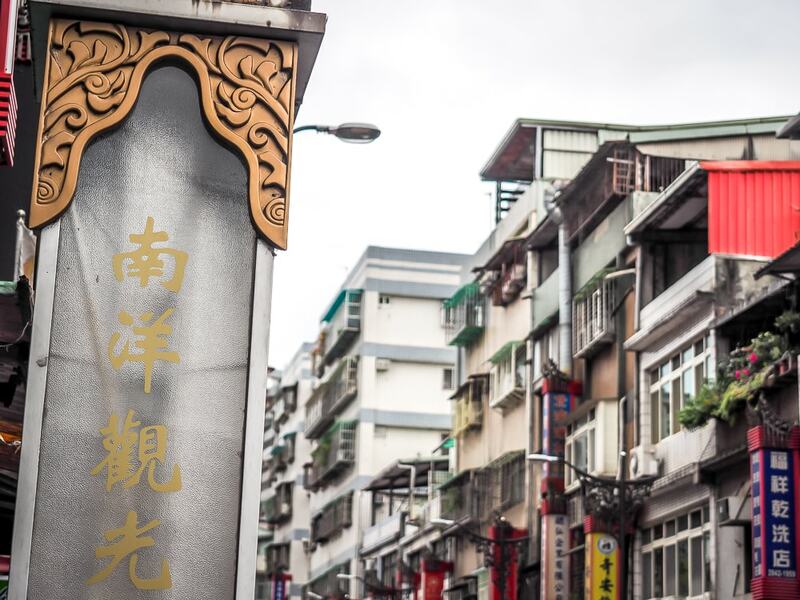 It’s easy to miss, so watch for the columns on either side of Huaxin Street with the characters 南洋觀光美食街 (Nanyang Sightseeing Food Street), as in the photo above. Actually, without looking too closely, you might not even realize you are on Burma Street, as there is little to differentiate it at street level from any other street in Taiwan until you notice the googly Burmese writing on many of the shop signs, and a few sections of the street have been pimped up with some red signage boards (photo below). 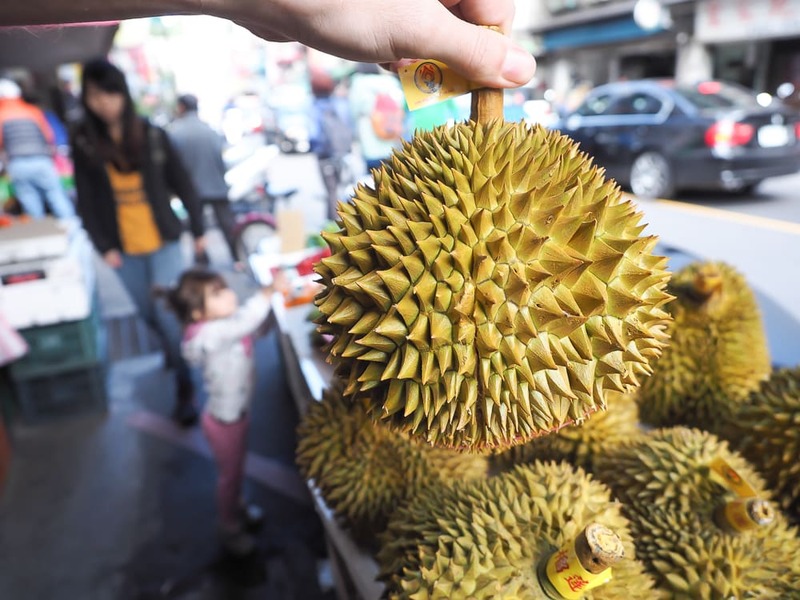 Alternatively, you can find the street on GoogleMaps by searching for Zhonghe Myanmar Street, Zhonghe Huaxin Street, or Nanyang Sightseeing Food Street. Let’s Begin our Food Tour of Burma Street! The following recommendations are roughly in order starting from the entrance, with odd numbers (3, 5, etc.) on the left side and even numbers (2, 4, etc.) on the right side of the street. The first Burmese hole-in-the-wall eateries you’ll spot are two Halal spots, Ruili Restaurant-瑞麗清真小吃店 (#7) and 786 Liyuan Halal Snacks-786李園清真小吃 (#9) on the left side. I’d recommend the latter for their famous Indian flat breads (印度烤餅 NT30) cooked in a tadoor-like oven just inside the restauarant’s entrance and served with butter and sugar, mashed chickpeas, or chicken curry. 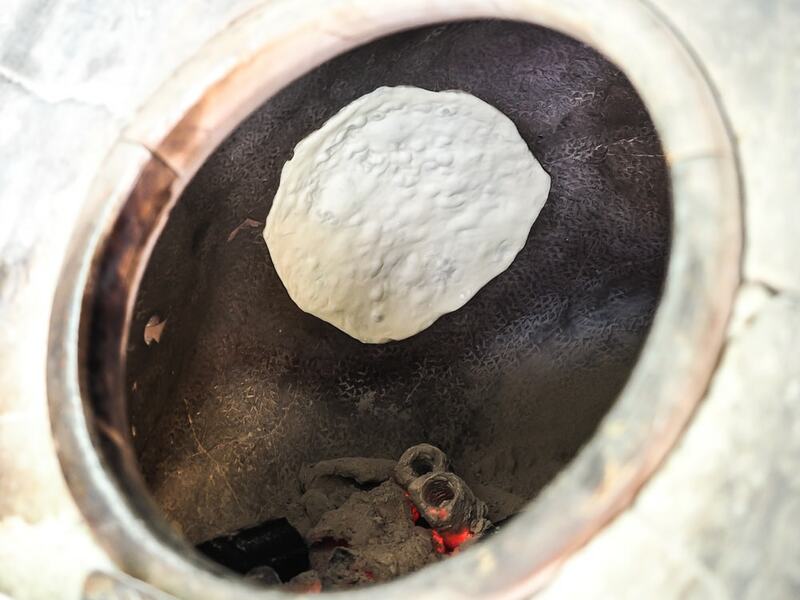 The proud owner/Indian flatbread maker at 786 Liyuan Halal Snacks told me to keep shooting as he demonstrated how he prepares the shop’s famous breads. Across the street, Manthiri Taiwan-曼第一緬甸商店 (#14) is the first Burmese grocery store you’ll see, where you can find curry pastes, lemongrass, dried goods, Southeast Asian instant noodles, sauces, and much more. A Wei Myanmar Snacks-阿薇緬甸小吃店 (#27) is another Halal shop, extremely popular for its mohinga, or Burmese fish curry noodles with banana stem (魚湯麵 NT70), a breakfast staple in Myanmar. 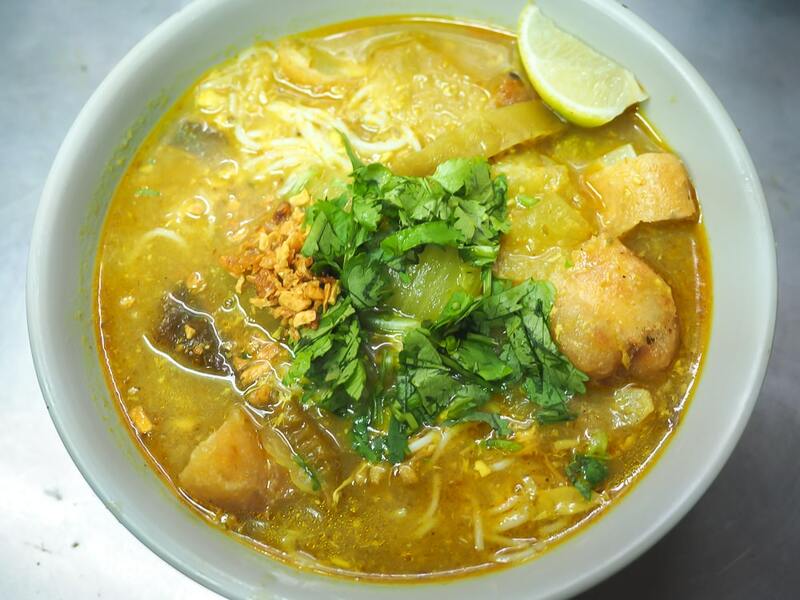 Cooked in a huge pot at the streetside, the spicy-lemongrass fragrance of the mohinga is so enticing it will literally force you to stop in your tracks and line up for a bowl. While there are several other shops on Burma Street selling mohinga, this one seemed to be the most popular among locals when we visited at lunchtime. The fish stew base is extremely delicious and rich, and the battered deep-fried hunks of banana stem actually taste like banana. Next door to A Wei, A Xian Yunnan Myanmar Foods-阿仙雲緬美食 (#29) has a range of dishes including deep fried doufen (炸豆粉), gelatinous tofu-like strips made from pea flour, and spicy thousand year egg tomato salad. 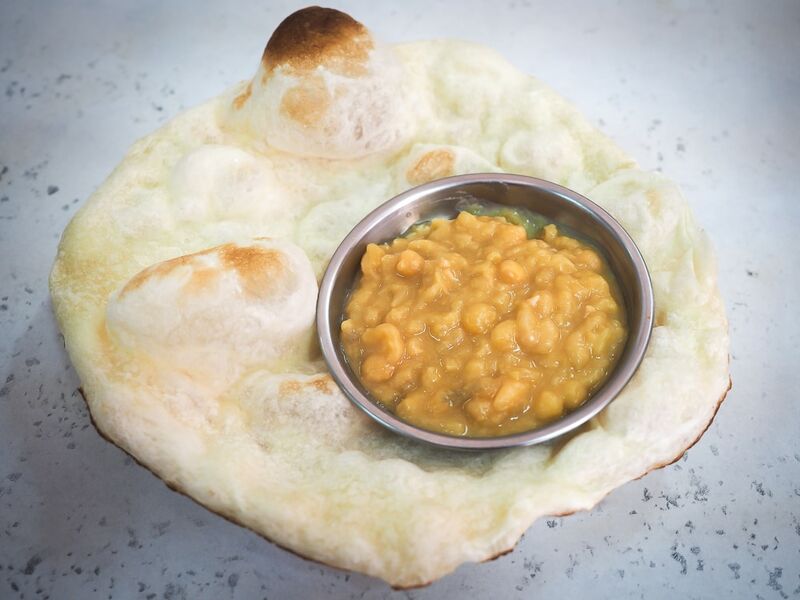 Blue Sky Restaurant-藍天印度烤餅 (#33) features more tandoori oven-baked flatbreads, milk tea, and other heartier dishes. Next door, Koufu Nanyang Flavor Restaurant-口福南洋風味 (#35) specializes in Yunnanese noodles dishes. 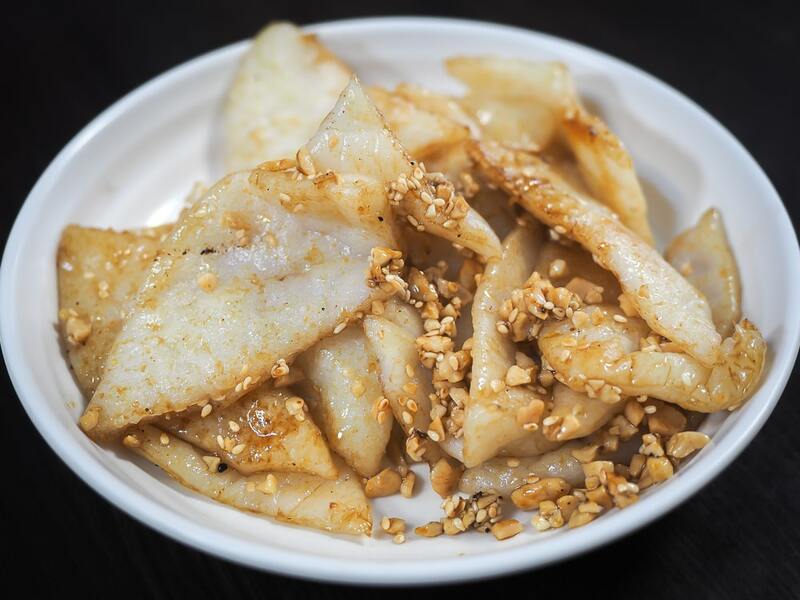 We had to try their Yunnan baked babasi (烤粑粑絲 NT65), a vegetarian dish of big hunks of chewy noodle that are coated with a sweet sauce with a hint of spice from Sichuan peppers and topped with peanut brittle and sesame seeds. The restaurant’s claim to fame is its Shouzhua fan (手抓飯, see second photo at the top of this article), an enormous NT$1500 shared feast of sticky rice and multiple dishes spread out on banana leaves, to be eaten by hand. The dish must be ordered in advance. Moving along, it’s my pleasure to introduce one of my best finds on Burma street: a humble restaurant called Baogelai-包哥來 (#53). Based on the fact that the restaurant is non-existant on GoogleMaps street view, this is a fairly recent addition to Burma Street. 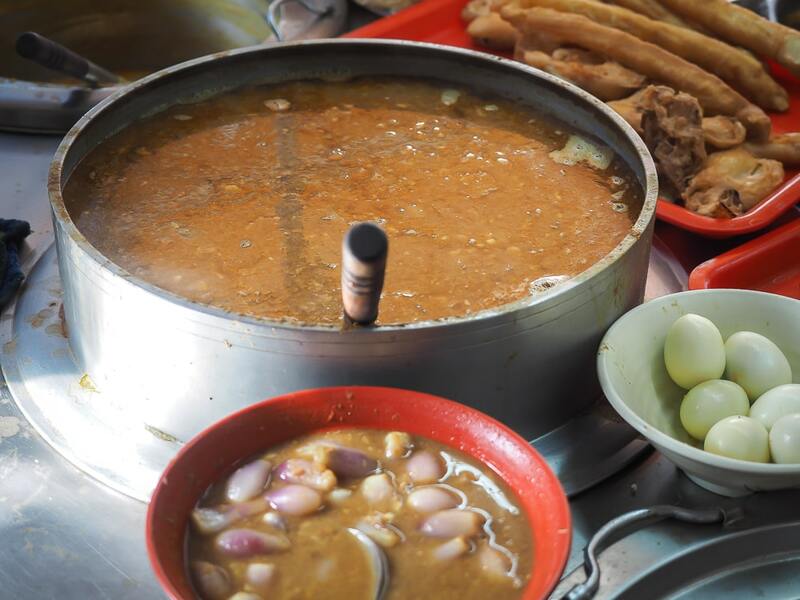 It’s easy to miss the sign, but watch for their food stall in front of their shop, pictured below, with a steaming cauldron of mohinga that can easily compete with A Wei’s more popular version down the street. What actually first drew me into this restaurant was the deep fried potato flour cakes and vegetarian potato curry set (馬鈴薯湯餅 NT60) advertised in a picture taped to the wall on the street. The set may look simple (see picture below), but the cakes are greasy and delicious, the curry is outstanding, and the little scoop of chutney that it comes with is an explosion of tamarind-y goodness in the mouth—a perfect accompaniment for the curry. 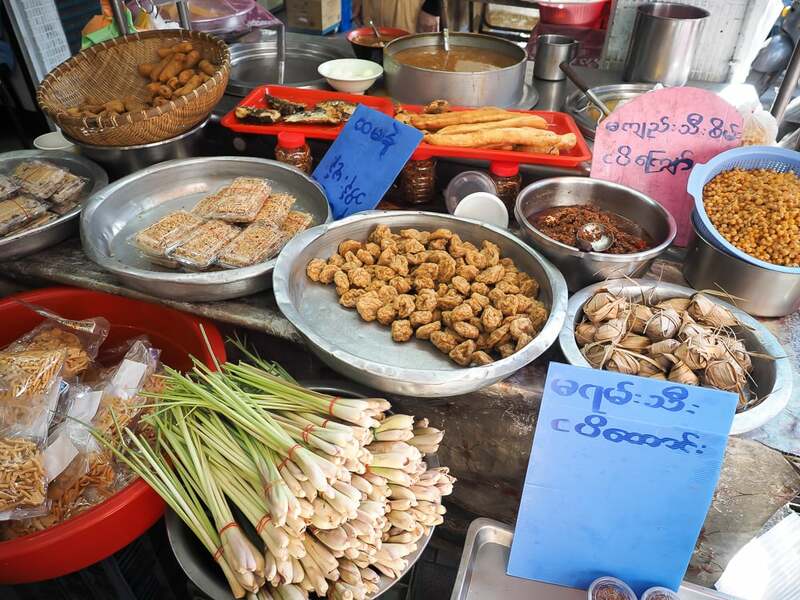 The shop also sells three cold tossed dishes: the famous Burmese lahpet thoke, or fermented tea leaf salad (涼拌茶葉), tomato salad (涼拌番茄), and ginger salad (涼拌薑絲), each for NT100. Each one is practically a meal, served with fried broad beans, peanuts, shredded cabbage, and tomatoes, but vegetarians should ask for no xia mi (small dried shrimps), and ask for the chilis on the side, unless you have a death wish. 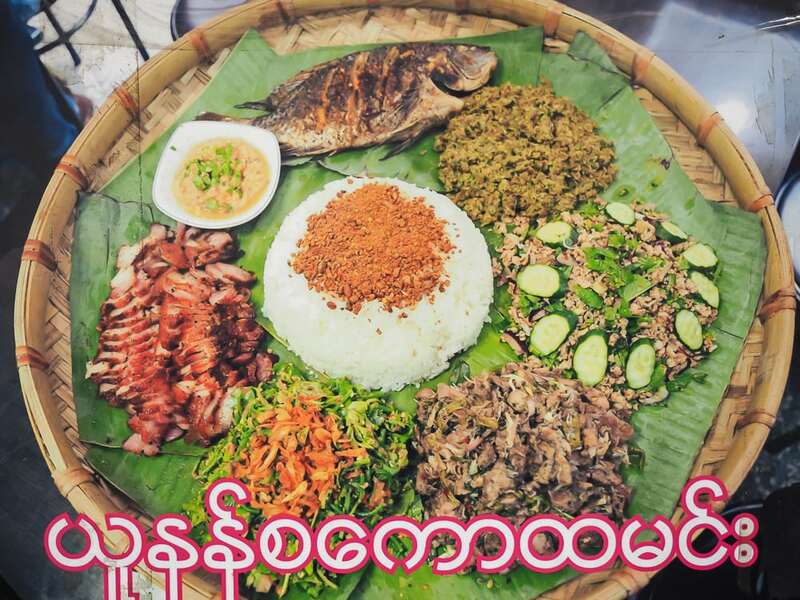 If you choose only one, go for the tea leaf salad, because where else will you have a chance to try this famed Burmese dish without actually going to Burma? We also tried and very much enjoyed the ginger salad, which is loaded with thin strips of raw ginger. 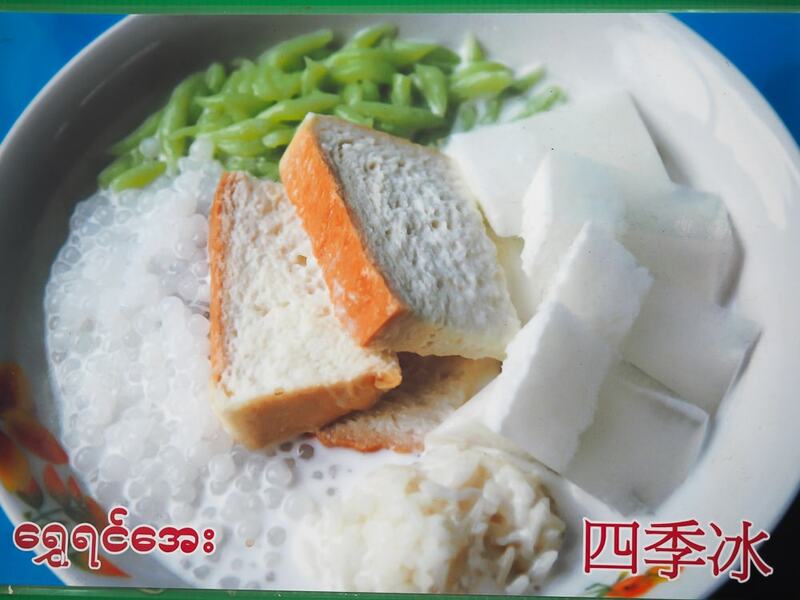 To finish off, curiosity got the best of us so we ordered a four seasons Burmese shaved ice (四季冰), which came with tapioca balls, coconut jelly hunks, green rice flour jelly worms, and corners of white bread. Four Seasons Burmese shaved ice. Yes, that is white bread on top. Hopefully you’ve made it this far, because we are about to get to my favorite dish on all of Burma Street. Jumping over to the opposite side of the street, there is a row of seven shops (including a second branch of Manthiri grocery store) that are very popular among local Chinese-Burmese and always have crowds of people lounging at the street-side tables. The first one at the corner, Taizu Guniang-傣族姑娘 (#38) serves my absolute favorite dish to get on Myanmar Street: cold tossed noodles (涼拌面), a specialty that is sold in at least 10 other shops on the street, but I’m convinced this one has the best. Remember when I said I used to eat at the same shop every day because it’s so good? This is the one. 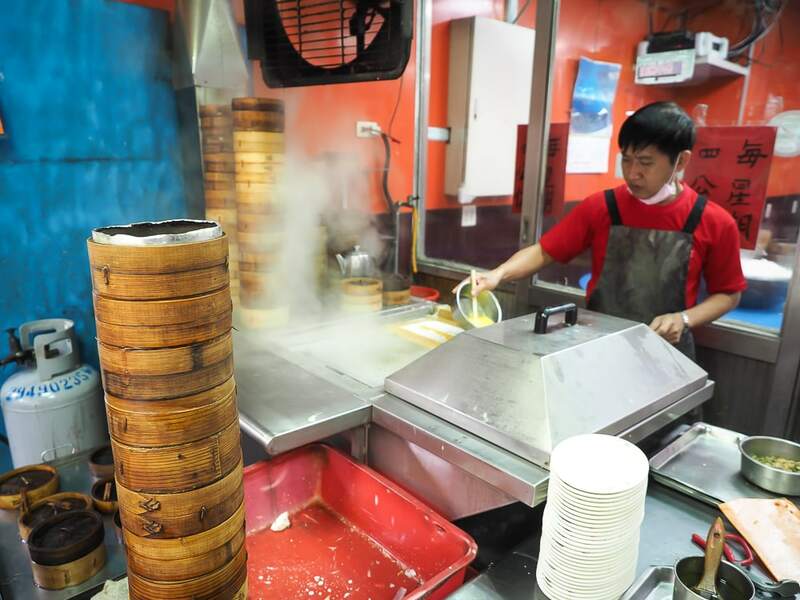 The chef here, lovingly referred to by patrons as Big Sister Ye (葉大姊) is a local superstar whose noodles will keep you coming back again and again. 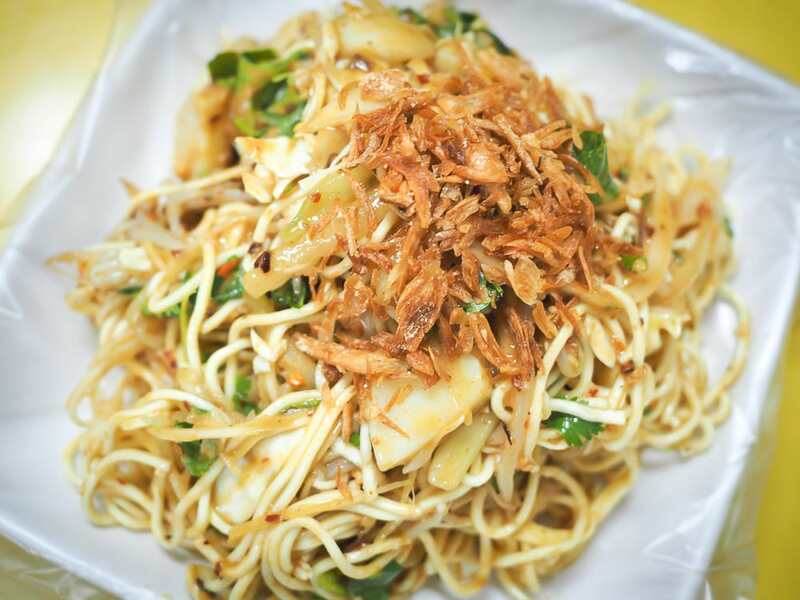 Your choice of regular or wide rice noodles are tossed with pototoes, cucumber, raw onions, bean sprouts and sauce, then garnished with fresh cilantro and a mixture of deep fried onions and dried shrimp (vegetarians should ask for no xia mi; the rest is fully veg). The sauce is like nothing I’ve tasted before and consists of soy bean powder, dried chilis, peanut powder, sesame powder, and one magical ingredient that gives this dish the zing that truly sets it apart: tamarind vinegar. Next door, popular Jin Long Snack Shop-金龍小吃店 (#40) has a range of interesting items, including vegan noodle soup (全素米線), bamboo babasi (筍絲巴巴絲), Yunnan cold 1000-year-egg (雲南涼拌皮蛋), doufen with vermicelli (豌豆粉米線), and grass jelly drinks. #42 and #44 feature more noodle, doufen, papaya salad, and 1000-year-egg dishes, while #48 specializes in Yunnan cuisine. The last in the row of shops, #48-1, has more special dishes incuding cold fermented tea leaf rice (茶葉涼拌飯), tossed cold tofu (涼拌豆腐), and more mohinga (魚湯麵). A little further down and across the street from the row of seven shops, there is one non-Burmese restaurant that cannot be skipped: Cheung Yu Dim Sum Restaurant-祥鈺港式茶樓 (#65). This great little Cantonese-style place is a refreshing change from Dim Sum restaurants in Taipei, which tend to be large, pricey, brightly lit, semi-formal affairs. This humble joint cooks up everything right out on the street, and I love their shrimp rice noodle rolls (蝦仁腸粉). Just past lane 50, there is a tiny, unassuming shop on the corner (it looks almost empty) that sells Indian/Burmese style betel nut. Unlike Taiwanese betel nut, which usually involves chewing a whole betel nut wrapped in betel leaf coated with white slaked lime paste (which activates the betel nut to give you that warming buzz when chewed), this kind of betel nut (if you choose the ‘sweet’ variety) includes diced chunks of betel nut mixed with a number of fragrant ingredients such as cardomon pod, anise, cinnamon bark, raw coconut, slaked lime, and more, all wrapped like a triangular samosa in the betel nut leaf. You can buy a single one (ask for yi ke) for NT$20, but you might want to wait until you find a private or secluded place, because the bundle disintegrates into a mouthful of little chunks that aren’t easy to spit out as you chew it, but the taste is genuinely yummy and more palatable than the non-sweetened/spiced Taiwanese variety. According to the vendor, you can spit out the first mouthful of saliva, and then swallow it from then on. 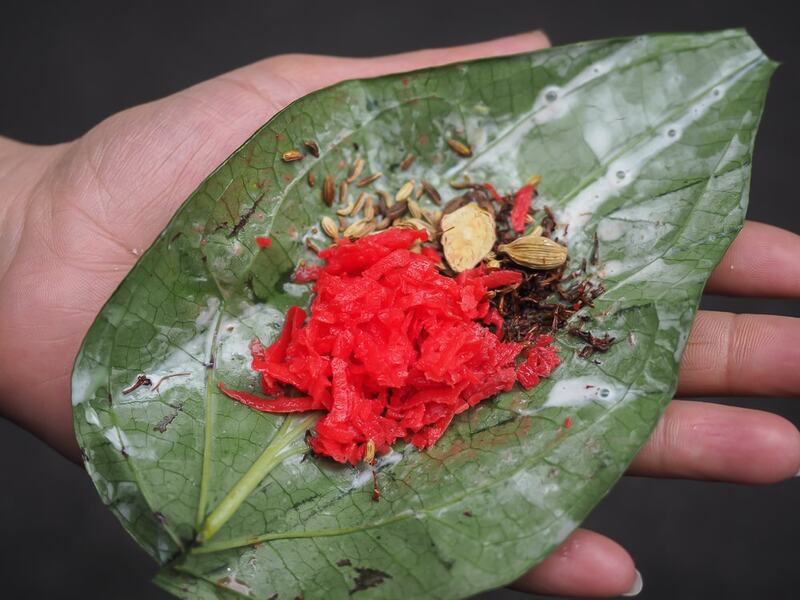 You won’t find Indian/Burmese-style betel nut anywhere else in Taiwan. If you’ve somehow made it this far down the street and are still hungry, not to worry, there’s still more to go! Past the betel nut shop, there’s a Burmese bakery at #58, buffet restaurant at #60, and cafe at #68. 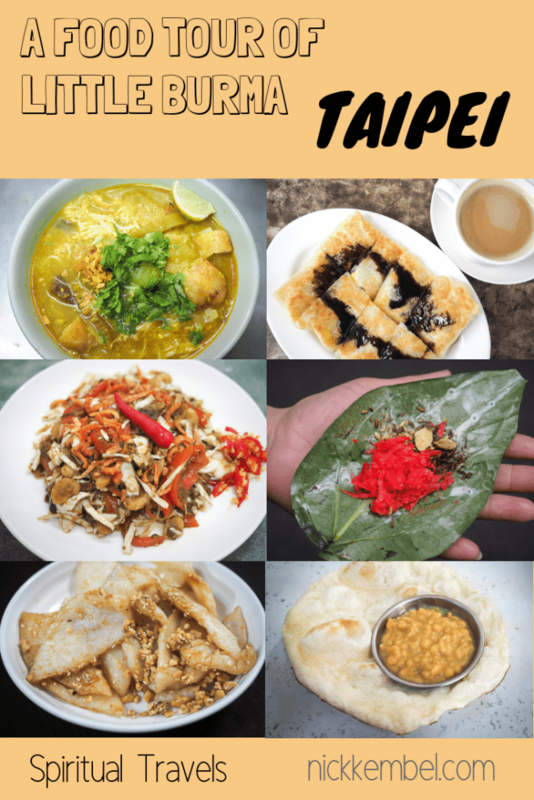 On the other side of the road, Lucky Star Tea Shop-沅保奶茶店 (#71) serves up an assortment or exceedingly delicious parathas and Southeast Asia-style banana pancakes; make sure to save some room for dessert here. 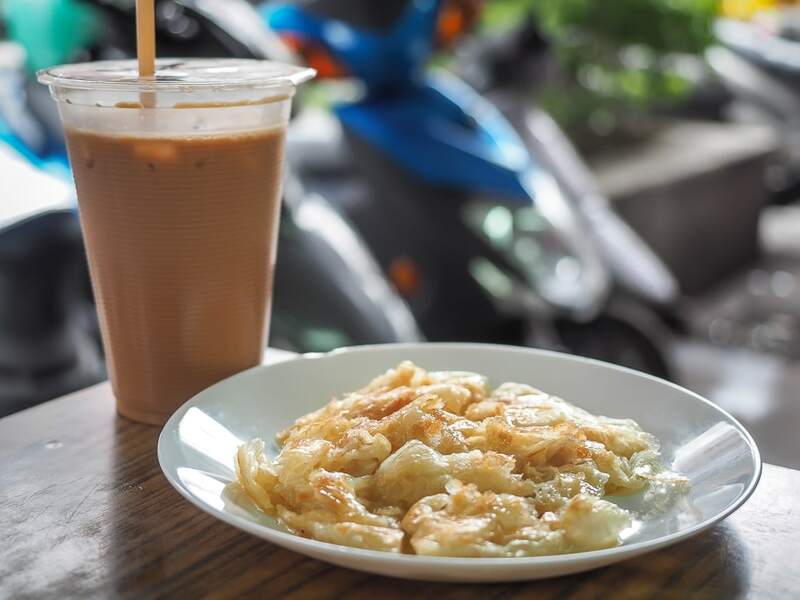 For a real treat, go for the paratha doused in sweetened condensed milk (check the 煉乳 option under parathas on the menu), washed down with milk tea or Burmese coffee (= instant coffee with lots of sweetened condensed milk). The cafe is really popular, especially on weekends, with outdoor tables for smokers extending halfway down the street. Paratha with sweetened condensed milk and milk tea. Sweet, sweet bliss. 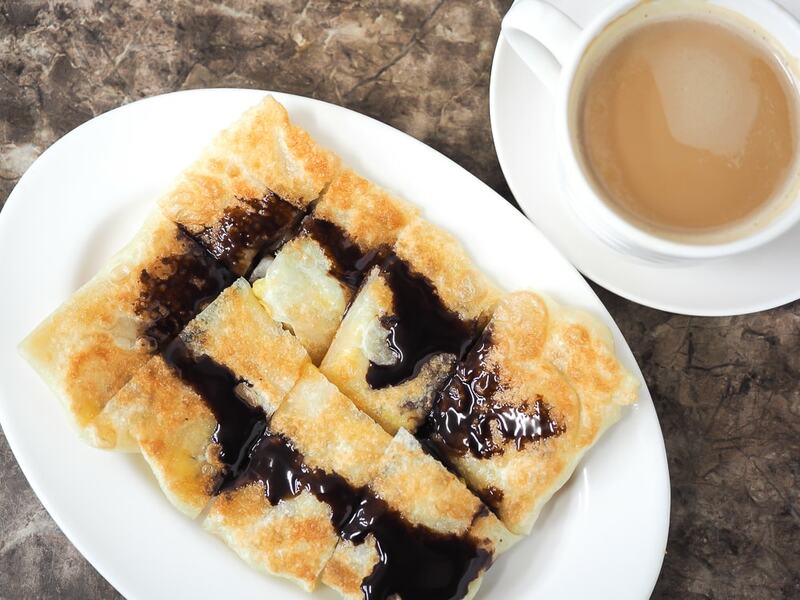 Banana pancake with chocolate sauce and cup of coffee-flavored sweetened condensed milk. Am I backpacking in SE Asia right now? Now that you’ve had dessert, you should seriously stop, but there’re still a few more shops before you reach the end of Huaxin Street. Across from Lucky Star Tea Shop, there is a point-and-choose place called Mother’s Kindness (母親的恩情, #60) that a couple Taiwan expats to me have claimed has the best dish on all of Burma street: a prawn curry in a rich onion-based gravy, and they also serve a number of mutton dishes. 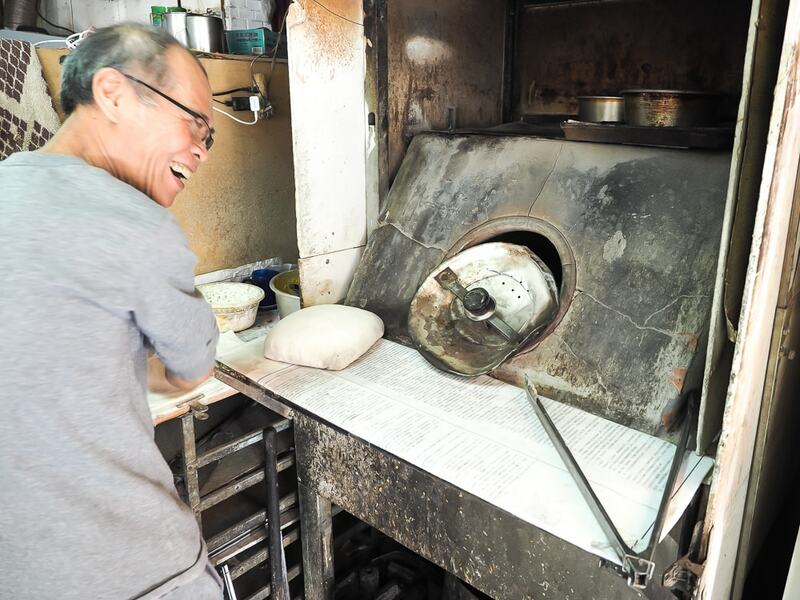 Next door, Yunnan Halal Snacks (清真雲南小吃, #62) is yet another place with a tandoor-type oven serving up flatbreads, milk tea, and snacks. A little further down, Indian Curry House-旺旺來天竺料理 (#77) specializes in Indian biryanis, puris, and they’ve got one noteworthy dessert: an Indianized version of Taiwanese black sugar cake (黑糖發糕). Finally, Xiangyuan-湘園美食 (#83) and Hongyuan-鴻園雲南美食 (#93) are two more Yunnanese restaurants that I’ll just have to save for another day. I know this Burma Street food tour may have seemed never-ending, but you’ve now reached the end. Though I’m willing to bet you now plan to visit Taipei’s Burma Street, then return again, and again, and again like I have!